Posted November 30th, 2016 by Symtech Corp & filed under Fluid Exchange, Newsletter, Uncategorized. The recommended intervals for changing brake fluid are all over the board depending on the vehicle manufacturer. Some OE’s recommend brake fluid service as often as 20,000 miles or every two years, yet some OE’s don’t even address it. This leaves it up to the consumer to consult what the manufacturer says in their owners manual or rely on the advice of a trusted service facility. Brake fluid lives in a sealed system and can survive for years, but moisture from the surrounding air can work its way in through hoses and other parts of the brake system. Most DOT brake fluids are hygroscopic, which means they absorb water/moisture from the environment at normal atmospheric pressures at a rate of 2-3% per year. This process can be amplified in more humid conditions and climates. Water in the brake lines lowers the boiling point of the fluid, so stopping ability can diminish as heat in the system increases. In addition, the moisture can cause internal corrosion in the brake lines, calipers, the master cylinder and other components. An ABS hydraulic pump can operate at several thousand psi, forcing brake fluid through very small valves. This can whip air and brake fluid into something like the foam on a latte, which makes bleeding difficult. Those same valves and pump can easily be damaged by tiny abrasive particles. Flushing and replacing brake fluid might cost $100 or less on many vehicles, but replacing rusted brake lines and other parts can run several hundreds of dollars or more, so clearly there’s value in keeping up with brake fluid maintenance. Have you ever struggled bleeding a hydraulic clutch? Have you found it difficult for a single technician to quickly complete the flush & bleeding of a brake system without help? 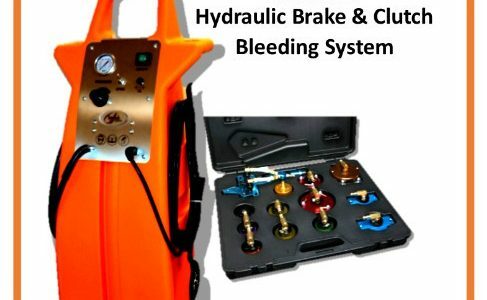 The SYMTECH Brake Flush Assistant (BFA1), is a complete Hydraulic Brake & Clutch Bleeding System. Using the BFA1 allows for one technician to flush and bleed a hydraulic clutch or entire brake system in less than 15 minutes! By filling and pressurizing the master cylinder with new brake fluid, the BFA1 allows the technician to open bleeder valves one at a time while the unit ensures a continuously full master cylinder, regardless of angle. Our clear tubing attaches directly to the bleeder valve which makes it very easy to see the change in fluid color and the removal of air bubbles. To view the BFA sales brochure, click HERE. Did you know Symtech factory personnel are available to come to your service facility and perform a free on-site demonstration of any of our equipment? Contact your local parts & equipment distributor or call 888.884.8182 to schedule your on-site demonstration. According to the IHS Markit report released November 22nd, 2016, the average age of light vehicles is now 11.6 years. That’s up from 11.5 years from 2015. 2016 registrations for light vehicles in operation in the U.S. hit a record 264 million, an increase of more than 6.2 million vehicles. The newly released 2016 IHS automotive study states the oldest vehicles on the road are growing the fastest. Vehicles 16 years and older are expected to grow 30 percent from 62 million units today to 81 million in 2021. In 1995, 65% of U.S. Households changed their own oil. Fast forward to 2015, and over 70% have someone do it for them. A 2016 income-related survey from Charles Schwab indicated 87% of Americans prefer to hire someone to change their oil. Symtech will be performing year-end inventory the week of December 26th. While we will be open, we will not receive or ship products during this week. You can download any Symtech Product Brochures by clicking HERE.